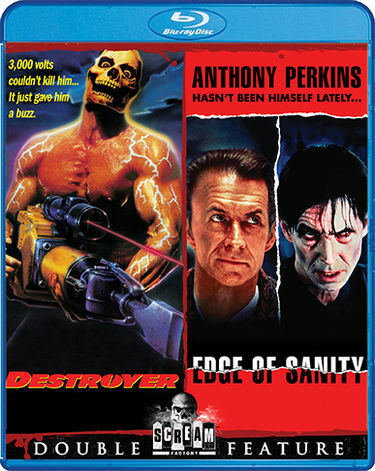 ‘Destroyer‘ – When Ivan Moser (football great Lyle Alzado), a convicted serial killer, is set to be electrocuted, a devastating prison riot erupts on the day of the execution. In the wake of the destruction and mayhem, the prison is shut down and Moser becomes a legend. No proof of his death exists. Eighteen months later, a film director (Anthony Perkins), intrigued by the legend of Moser, decides to use the prison as a film set. On the last night of filming, the truth of Moser’s fate is about to be revealed. The film crew, trapped inside the prison, begin to disappear one by one. This electrifying thriller also stars Deborah Foreman (‘Valley Girl’) and Clayton Rohner (‘I, Madman’). ‘Edge of Sanity‘ – The uncut version features Anthony Perkins stars as an outwardly rational Dr. Jekyll who rapidly descends into a world of sexual obsession and murder as Mr. Hyde… and who may also be Jack the Ripper! A shocking new twist on one of the most infamous crime stories of all time, this terrifying thriller will keep you on the cutting edge of fear! After a lab experiment unleashes mysterious fumes, Dr. Henry Jekyll undergoes a horrifying transformation into a savage alter ego who calls himself “Jack Hyde.” Meanwhile, the depraved killer Jack the Ripper is slicing his way through the alleys of Whitechapel, leaving mutilated streetwalkers in his wake. Is there a connection between Jekyll/Hyde and Jack the Ripper? And can anyone stop this reign of terror? This entry was posted on Wednesday, March 23rd, 2016 at 3:59 pm	and is filed under Film, News. You can follow any responses to this entry through the RSS 2.0 feed. You can skip to the end and leave a response. Pinging is currently not allowed. « Amazon’s ‘The Tick’ Has Found Their Lead!! !